Wedding Papers — Custom Wedding Invitation Designer and Calligrapher | North Carolina | Goldie Design Co. Custom Wedding Papers... are they for me? I'm so glad you asked! I only offer complete custom wedding paper suites - this means that each and every wedding suite is created and designed totally for you, based on your theme, style, personality, etc. No two suites are the same, and they are not intended to be! Upon discussing your ideas for your dream invitations, I come up with a totally unique design implementing all of those things you love! It is very easy to find pre-designed wedding papers all over the internet (think Minted, Etsy, etc.) at a lower price point than custom wedding invitations. Pre-designed invitations have a lot less flexibility in the design and style of your invitations, in that what you see is what you get! Custom wedding invitations, however, are totally and completely built around you and what you have planned for your big day! Along with this total custom design aspect, you also get to work directly with me to ask as many questions, make as many changes, and tweak until it's just right. My clients can email me as many times as they want, and will be kept up to date throughout the entire process! My feelings are not hurt at all if pre-designed invitations seem more your style and are what you are comfortable with, that's why I love to explain the difference between the two! Do you think custom invitations are the way to your heart? Fill out this custom wedding paper questionnaire to get started, or keep reading for additional information! On average, my clients spend from $1,800 - $3,500 for a set of 150 wedding invitations. 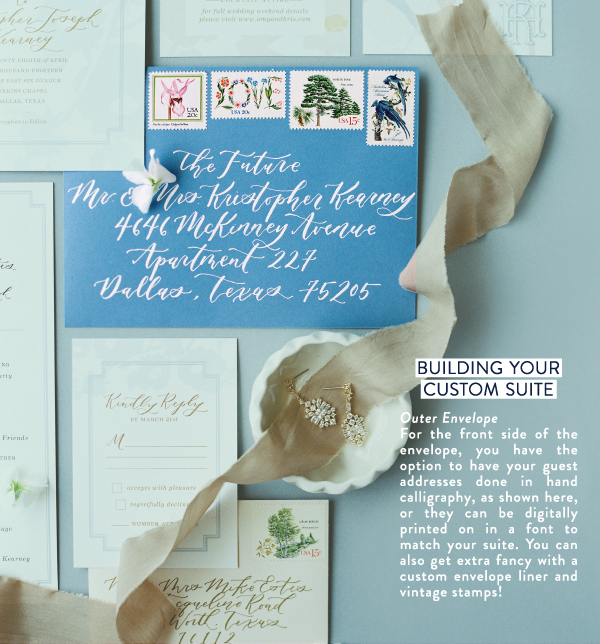 The lower end of this range would include the basic pieces of a suite (invitation card, information card, RSVP card + envelope, and an outer envelope), and the higher range would be with added design details such as calligraphy addressing, custom envelope liners, vintage stamps, belly bands or ribbons to tie around your pieces. To learn about all of the different pieces that can be included in your suite, click through the Custom Suite Component Guide below! There are several different pieces that can make up a wedding invitation suite, and endless options when you are doing a custom design. This guide will take you through the typical pieces included in a wedding invitation suite and what their purpose is. Depending on what information you wanting to include in your invitations for your guests, the combinations for your own suite are endless. Click through the images below! Click the link below to be taken to the custom wedding paper questionnaire! Fill it out and I'll be in touch!